A dozen years after 9/11 and the start of the war in Afghanistan, the public has mixed opinions about whether certain policies have made the U.S. safer from terrorism. A new survey of the general public — as part of the quadrennial America’s Place in the World survey conducted Oct. 30-Nov. 6 — asked whether government surveillance programs, the use of military drones and the war in Afghanistan have made the country safer. Of these three issues, Americans are most in agreement when it comes to military drones that target extremists in Pakistan and elsewhere. Among those we surveyed about these anti-terrorism policies, half say the policy has made the U.S. safer. 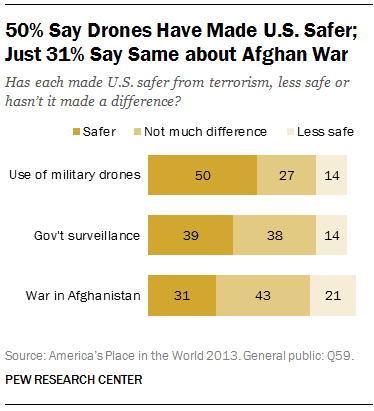 Just 14% believe drones have made the U.S. less safe and 27% say they have not made a difference. Americans are more divided on the impact of the war in Afghanistan, which began in 2001 and has resulted in more than 2,100 American deaths. About three-in-ten (31%) believe the war has made the U.S. safer, while 43% say the war has not made a difference and two-in-ten (21%) say it has made the country less safe from terrorism. Democrats and Republicans disagree about the war’s effect on the nation’s safety. Among Republicans, 41% say it has made the U.S. safer and 17% think it has made the country less safe. But Democrats are less likely to believe that the U.S. is safer because of the war (27% safer vs. 23% less safe). Independents, too, are less optimistic than Republicans about the war’s impact (28% safer, 21% less safe). The new survey also found divided views about the U.S. government’s phone and internet surveillance programs. About as many Americans (39%) believe the surveillance has made the country safer as those who say it hasn’t made a difference (38%). In this regard, Republicans, Democrats and independents are largely in agreement. Our surveys have shown that Americans’ views about surveillance are complicated. Several months after Edward Snowden first leaked classified information about government surveillance programs, more than half of Americans (55%) say they think the disclosures have harmed the public interest; just one-third (34%) say they have served the public interest. But that’s not to say that the public isn’t concerned about the programs. By a margin of 44%-39%, more are concerned that the government’s anti-terrorism policies have gone too far in restricting the average person’s civil liberties than say the policies have not gone far enough to adequately protect the country.